Pumpkin Spice No Bake Cookies are filled with cozy fall spices and plenty of white chocolate chips! Thank goodness they are easy because you will probably find yourself wanting to make them all fall long! Are you one of those people who can’t wait to drag sweaters out of the corner of the closet? Are you loving the shorter days and the chillier mornings? If you are I’m guessing you are also ready for all things apple and pumpkin! If you are ready to cozy up by the fire in your flannel jammies, these Pumpkin Spice No Bake Cookies have your name written all over them! I’ll take all the yummy apple and pumpkin food I can get, but I wish I could have it without having to give summer up! I’d rather wear shorts and T-shirts than jeans and sweaters. I’d rather exercise outside in the sunshine than in my basement, and I’d much rather have my kids home than have them spend their whole day at school. 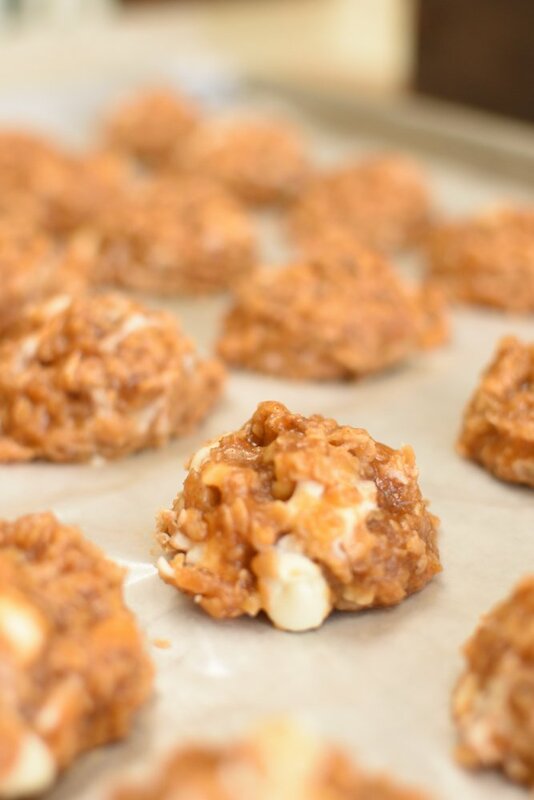 Like most no bake cookies, Pumpkin Spice No Bake Cookies only require a few ingredients and just a few minutes to make! That’s my kind of recipe! The fall time is one of the busiest times of the year on the farm. We are still harvesting crops, and the kids are all in school which means I’m getting my share of seat time in the tractor (which is way more fun than sitting in the office). My garden is in full swing so there’s plenty of canning, freezing, and preserving that needs to be done. Of course there’s never-ending yard work, getting back into the homework and piano practicing routine, and all the other normal odds and ends that need done. If you’ve ever been on my blog before you probably already know we eat dessert every day around here…usually twice a day. What I’m saying is dessert must happen even on super busy days! That’s why I have a whole pile of easy dessert recipes. You can check out all my other no bake recipes. 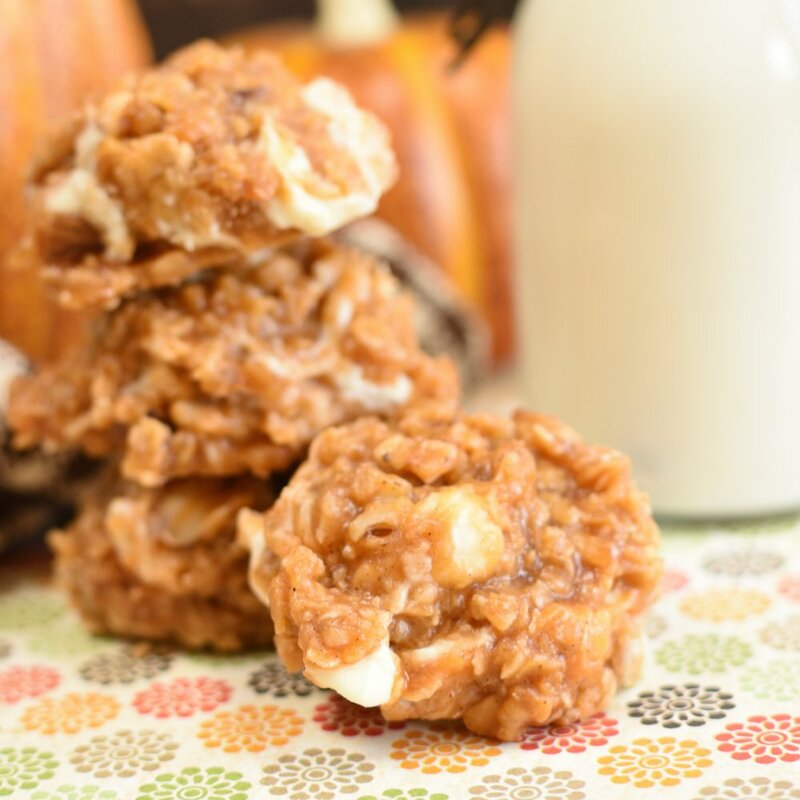 Pumpkin Spice No Bake Cookies are at the top of my favorite fall treats and I think they will be one of your too! Watch this video to see exactly how to make them! It couldn’t be easier! Today is the last warm day in the forecast so I’m headed outside to soak up every last bit of sunshine I can before it rains. And when it does rain I bet I’ll be whipping up all pumpkin treats! Who could resist? 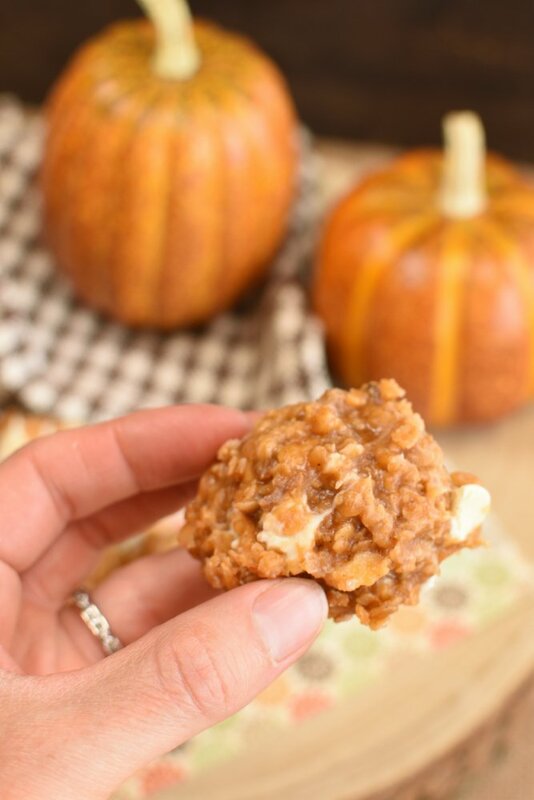 Pumpkin Spice No Bake Cookies bring together all the best flavors of fall in every scrumptious bite! 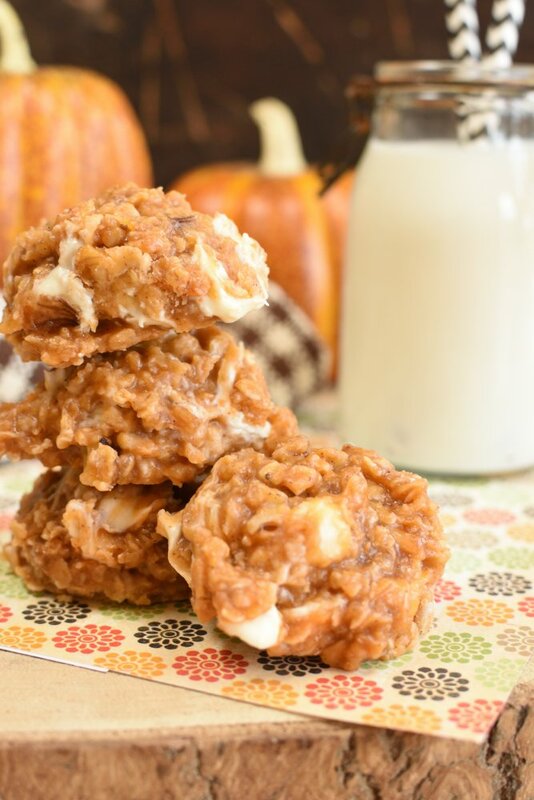 Celebrate the autumn leaves, the crisp air, and all things pumpkin with these cookies! Be sure to sign up for my NEWSLETTER and I’ll send you super easy recipes straight to your inbox! Pumpkin Spice No Bake Cookies are the easiest cookies in the world to make! They bring together all the best flavors of fall in a scrumptious cookie! Bring sugar, butter, and evaporated milk to a rolling boil over medium heat. Stir frequently. Remove from heat and add oats, dry pudding, pumpkin pie spice, and salt. Stir. Let sit for a few minutes until it cools a little bit. While it's cooling line a cookie sheet with wax paper. Add white chocolate chips and walnuts to cookie mixture. Gently stir being careful to not over stir or else the chocolate chips will be totally incorporated. Drop by cookie scoopfuls onto wax paper. These look so good! I’m going to surprise my boys and make them before they get home from school! You are such a fun mom Jen! Your boys will be thrilled! Happy Fall! I am so ready for fall and all things pumpkin! These are just the perfect treat to start the season. I want to hold on to summer as long as I can, but I know fall is right around the corner! And as long as it’s here we just as well eat all things pumpkin right? I love no bake desserts, especially when they’re pumpkin spice! 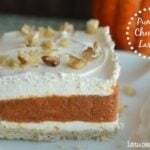 No bake and pumpkin…two of my favorites right there! Thanks Kimberly! They are a great way to bring in the chilly fall weather! 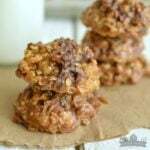 Can’t belive that these cookies are no bake! Look great! 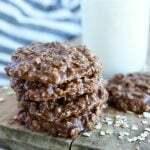 No bake cookies are on of my favorites! You just can’t beat how quick and easy they are; not to mention how yummy! Thanks! Bring on all things fall right? These sound yummy!! I plan to change this recipe and make it sugar free except the white chocolate!! I’ll let you know how they turn out. Oh I love that idea! I can’t wait to hear how it turns out! Can you freeze these . I imagine these would freeze just fine but I’ve never tried it before. Let me know how it works if you try it! 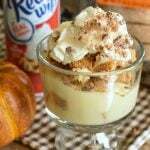 I would like to receive more recipes like this, especially around Thanksgiving and Christmas.